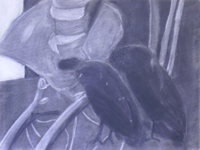 An original charcoal drawing of two crows sitting next to the pelvis of a skeleton, clearly an omen of things to come. This was created by covering the entire sheet of paper completely with charcoal, then erasing that which was not needed. Even the whitest whites still have a bit of charcoal embedded, while the darkest darks are completely black. This black and white Halloween themed artwork is also appropriate for Gothic clothing and decor.